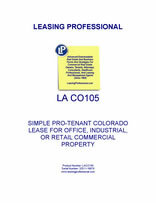 This form is for a single tenant Colorado lease where the tenant has superior leverage. It gives the tenant the right to use the premises for "any legal use," and has very abbreviated remedies for the landlord in the event of a tenant default. It is also pro-tenant in character because of the clauses it does not contain which customarily appear in pro-landlord forms relating to remedies and a variety of other pro-landlord provisions. 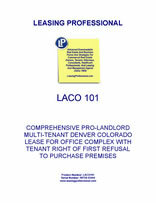 This form is designed for a multi-tenant Colorado office complex where the landlord has superior leverage. Several exhibits are included with the form (see below). The tenant is responsible for its pro-rata share of operating costs. The form also contains renewal options and a right of first refusal in favor of the tenant to purchase the premises. Seventy-five percent of the land area in the U.S. above 10,000 feet is in Colorado: The thirteenth step of the state capital building in Denver is exactly one mile above sea level. Major industries in the state include agriculture, mining and winter sport-related tourism.